Brad Voytek, PhD, a post-doctoral fellow at the University of California, San Francisco, makes use of big data, mapping, and mathematics to discover how brain regions work together and give rise to cognition. In his work as a researcher, science teacher, and outreach advocate, he regularly uses social media such as his blog Oscillatory Thoughts, Twitter, and Quora. In 2006, he split the Time magazine Person of the Year award. Q: You’re interested in leveraging data to modernize science. Do you see a role for social media in changing research? Social media already is changing research. In many ways! First, there’s a direct effect wherein scientists are beginning to use data collected by social media organizations to analyze behavioral patterns, such as a study from 2011 that looked at millions of tweets to analyze fluctuations in mood. The way we conduct and communicate research is also changing. Since the 1600s, scientists have communicated findings through peer review. But these results are static, and conversations regarding specific study details, methods, etc. were private. Now, scientific publishing organizations like Nature Network or SciVerse and professional sites such as Mendeley and ResearchGate are providing platforms for open communication and ongoing conversations about research projects. Q: You’re using social media to promote your work. What motivates you to do that, and what do you see as the benefit? While in a sense the first statement is correct, “promotion” is a loaded term. Science is an opaque process, and scientific publications are jargon-laden, dense documents that are inaccessible to all but the field-specific experts. These publications give an idealized view of the scientific process–from clear hypothesis to statistically significant result. The reality is a world messier and less certain than that, and I use my blog to communicate that. Having students just jump in and read these artificially-refined and specialized manuscripts and expecting them to learn from it is like trying to teach English by having someone read Shakespeare: it’s technically correct but the end result will be a mess. I get a sense that many of my blog’s readers are undergraduate and graduate students, and I aim to communicate the real difficulties and uncertainties of science with them. I remember being there feeling confused, and feeling really dumb because I didn’t “get” scientific papers and could never imagine myself coming up with a novel idea, running an experiment to test it, and writing a paper. I remember looking at the CVs of really smart post-docs and professors and seeing page after page of amazing compliments and thinking I was inadequate. My goal is to demystify the scientific process, to make it more real, to show how hard everything is, but also that it’s doable. I’ve got a whole section of my CV titled “Rejections & Failures” outlining every grant or award I was not given, every paper not published. I believe that listing those failures shows fledgling scientists that the process is hard, but not because it requires super-intelligence, but rather super-diligence. Q: You recently made an offer on Twitter inviting people to ask you questions about neuroscience. Can you tell us about that? This exemplifies another reason I blog, use Twitter, etc. When teaching, I took to heart the idea that if you can’t explain something clearly, then you truly have not internalized it and don’t really understand it. 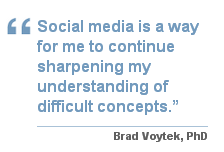 Social media is a way for me to continue sharpening my understanding of difficult concepts. The time investment isn’t important to me–my job is to learn and discover, and this is another aspect of that. And if in the process I make something more clear and accessible to a possible future scientist, all the better. No scientist achieved their breakthroughs because they communicated less. As for the offer on Twitter, I got quite a number of excellent questions, but a few stood out that really made me think. Specifically, there were three that are directly relevant to my research and that got me digging around the literature some more to figure out the answer. The questions essentially boiled down to two ideas: First, how plastic is a mature brain? And second, how many neurons can you lose before you (or someone else) notices? Ultimately I wrote a blog post on what I’d found and rolled some of that writing and those ideas into peer-reviewed papers I’m still working on. This kind of challenge, discussion, and ideation exchange is extremely valuable for me, and it’s part of the reason that I make offers such as the one on Twitter or use Q&A sites such as Quora. Quora is a particularly interesting example. It’s a site populated by very intelligent people, but given the kinds of neuroscience-related questions that appear there, it’s clear that there are still some pervasive misconceptions about how the brain works. On a site such as that, the feedback and discussions seem to flow a bit more easily than they do on my own personal blog, but they’re not limited in scope as on Twitter. It’s a nicer platform for the level of discussion I’m seeking. Q: Lots of scientists are not using social media. When asked why, many say they don’t think people will care about their scientific work. What do you think about that perspective? People who say such things underestimate the interest level and intelligence of the non-scientist public. When I hear this, in my head it translates to either, “I don’t care about what I’m doing,” or, “I’m not confident enough in what I’m doing to explain it to anyone who may ask really simple questions that undermine what I do.” The former is fine; not everyone needs to “love” their job or work to be excellent at it. The latter is emblematic of unclear thinking. Q: What tips can you give researchers who are thinking about using social media but don’t know where to start? Generally the tips I’ve seen from a lot of bloggers are “write consistently” and “be engaging”, but that’s like saying to be a good scientist you need to “work harder and be smarter”: technically true but not very useful. I wish I had some magic formula for how to be successful at using social media for science, but I don’t have such a thing. I find social media helpful to clarify my thinking, but other people may have other methods of accomplishing the same result. The only remaining advice I have is to seriously consider the reasons for not using social media: are you not blogging/tweeting/whatever because you honestly think it’s a waste of time and can see no return-on-investment for you? Or, are you not doing it because simplifying your ideas is too challenging? This Q&A is part of “Digital Media & Science: A Perspectives Series from CTSI at UCSF” and was originally published on the UCSF CTSI website. This series explores how digital media and communications can be used to advance science and support academia. Brad is also interested in leveraging data to modernize research. He’s one of the creators of brainSCANr, an online resource that uses existing publication data to show the probability of relationships between neuroscience topics and ultimately support the discovery of novel research ideas. He is also a fan of zombies, and has devoted some of his time to mapping brain damage that would be caused by zombification.